Magnesium Oil for Hair Loss - FASCINATING Studies! Can magnesium oil be THE ultimate answer for baldness cure? While searching for hair loss remedies, the term “magnesium oil” kept popping up here and there. Curiously enough, we came across some fascinating information on using magnesium oil for hair loss. Be ready for some surprising information (along with a BUNCH of study findings). Here, we will first cover the basics of magnesium (Definition, benefits, and deficiency symptoms). 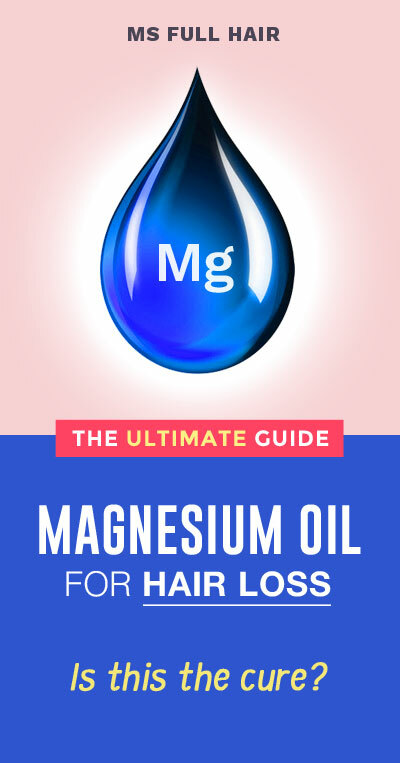 Then, you will learn how and why magnesium oil can effectively promote hair regrowth and how to get the maximum magnesium benefits for hair loss prevention for growing your hair back. Magnesium is one of the most abundant mineral elements in the body. We have about 25 grams of magnesium as an adult, in which more than half (50-60%) are found in bones, followed by soft tissues. Our body needs a LARGE amount of magnesium in order to regulate 300+ enzyme biochemical reactions and many other functions. As a macro-mineral, magnesium plays a crucial role within our cells in maintaining hundreds of proper body functions. What is magnesium good for? Some of these roles include balancing our immune system, strengthening bones, regulating blood pressure, synthesizing protein, producing energy, regulating muscle and nerve functions, and creating DNA and RNS in the body. In other words, we need magnesium in order to stay healthy (and “normal”). What are magnesium benefits for hair growth? There are two important roles of magnesium when it comes to hair and how it prevents hair loss and encourage hair growth. Our hair is made of protein (also often referred to as keratin). Without magnesium, amino acids cannot be properly converted into proteins, which over 90% of our hair follicles are made up of. It’s also important to note that the body needs LOTS of magnesium for this protein synthesis process and this in turn ensures the healthy hair growth. A number of studies suggest that hair loss can be attributed to calcium deposits in follicle cells. Often caused by scalp inflammation, calcium buildup interferes with proper follicle growth by clogging the pores and malnourishing hair follicles. Magnesium helps dissolve these excessive calcium deposits from our follicles, which results in providing essential nutrition through the blood supply to the follicles and restoring the normal growth cycle. Below – Magnesium and hair loss – covers about this point in great detail. According to Dr Carolyn Dean, the author of The Magnesium Miracle, most of us are deficient in magnesium (Her book is in fact worth reading as she has dedicated her whole life researching magnesium and how it affects the human body). Another useful piece of data by the National Health and Nutrition Examination survey shows that 68% of Americans are short on the daily recommended amount of magnesium intake. How can I find out if I have a low magnesium level? According to National Institutes of Health (NIH), this is not an easy task. Why? Because magnesium is mostly located inside the bones (50-60%) and inside the cells. While a number of different testing methods can be used to find out the magnesium level (through urine, saliva, blood-work just to name a few), NIH mentions that you’ll need comprehensive lab tests and assessments if you want to get a mostly accurate measurement (Yet again, this still doesn’t guarantee a “100% accurate” magnesium status). Then, how do I know if I am magnesium deficient? The easiest yet most accessible way appears to be by paying attention to some of the symptoms caused by magnesium deficiency. The early sign of low magnesium includes muscle weakness and spasms, osteoporosis, high or irregular heartbeat, loss of appetite, vomiting and seizures in the worst cases. Now that you have a brief overview, let’s talk about how magnesium is related to baldness. There are a number of different elements involved here in order to show you how magnesium deficiency and hair loss are related together. Inflamed scalp is one of your worst enemies when it comes to thinning hair and balding. Seborrheic dermatitis: A type of rash that causes redness, crusty flakes, oily appearance on the scalp. What do these different types of scalp inflammations have in common? They ALL interfere with the proper growth of hair follicles and thus could be the result of premature hair loss and excessive hair fall out. A 2011 study (1) published in the Journal of Drugs in Dermatology shows how inflammation affects androgenetic alopecia (Also known as female or male pattern baldness). The researchers performed scalp biopsies of 52 women with androgenetic alopecia over a period of time. The result shows that over 60% of participants showed inflammation and immunoreactants (immune response to recover inflammation) in their follicles. Another study (2) shows the relationship between inflammatory cells and alopecia and how inflammation infiltrates the bulge of follicles, which results in impairment of the normal growth cycle, thus causing hair loss. According to a study “The mineralization of hair follicle tissue” (3), mild skin injury can cause hair follicles to be susceptible to mineralization. When researchers tested this theory on mice, they noticed the increase amount of calcium in hair follicle tissues within 3 hours. Another observation by Frederick Hoelzel (Written for the Journal of the American Medical Association in 1942 – yes, a long time ago) shows a possible relation between calcification and baldness. He shares his direct observation how the amount of blood vessel supplies to the scalp and number of hair follicles are correlated (he found this out by accident, when he was examining 80 cadavers for other neuology use). He continues that those with baldness showed the scalp calcification with the restricted blood supply to the follicles (which he calls “ivory dome”), while those who had full hair on the head didn’t seem to have this calcification issue. Now, then the question becomes: how can I remove calcium build up from the scalp? That’s where magnesium oil for hair loss comes in. Your body needs magnesium for hundreds of biochemical reactions, but so does your hair follicles and calcified scalp. In a 2017 study (5), Dr. DiNicolantonio mentions that magnesium is sometimes referred as ‘nature’s physiological calcium blocker’. What does this mean then for people having hair loss due to scalp calcification? Both studies / experiments show the essential role of magnesium in relation to balancing excess calcium in tissues, which includes hair follicle tissues as well. Magnesium oil is a natural way to dissolve excess calcium deposits in the follicle cells as well as in the body. There are basically 3 ways you can incorporate magnesium for hair growth: consumption of foods high in magnesium, magnesium supplements, and topical magnesium oil for hair loss balding. Almonds have the most magnesium content per serving (80 mg / serving), you can easily get an individual sized package and take it to work for healthy snacks. Magnesium supplements are another great way to prevent hair loss. What’s the best magnesium supplement for hair growth? Option #1: If you are going for “quality” all the way, this magnesium supplement is your answer. The company takes the quality of their supplements seriously by starting careful ingredient sourcing, strict manufacturing processes, and independent 3rd part lab testing to ensure both quality and full potency. Option #2: MagSRT’s magnesium supplement is another great option to consider, because of its sustained release formula (also commonly known as the time-release formula). A supplement with a sustained release formula is claimed to be a lot more effective than taking a regular supplement. Why? Its spread-out time release technology gives your body a longer period of time to fully receive the content, instead of just doing it one-time. What’s the best magnesium oil for hair loss? Get PURE magnesium oil for hair: When it comes to finding best magnesium oil for hair growth or any other topical uses, what really matters is the source of magnesium in order to ensure it comes from pure and uncontaminated mineral. Option #1: THE most famous (and well-known) magnesium oil is from Ancient Minerals which comes in 3 different sizes. If this is your first time applying the magnesium oil spray for hair loss, get the smallest size (this one) to test it out first. Option #2: This magnesium oil spray is another option to consider. In fact, it also happens to be the Amazon best seller. Also sourced from the Zechstein Seabed, their magnesium chloride oil is 100% pure and provides rapid absorption rate. Note that magnesium oil, in general, is available in the form of magnesium chloride – a type extracted from sea water. Quick Q&A – Are there any more magnesium oil uses other than using it grow hair back? There are plenty. The most common magnesium oil uses among people include: relieving muscle aches, alleviating muscle cramps (especially leg cramps), reducing back pain, soothing sore muscles, aiding sleep disorder, and getting rid of headache naturally by topically using magnesium spray. Some are even using magnesium oil for nails strengthening effect! Magnesium oil is likely to be safe and effective for adults and kids. However, people with sensitive skin sometimes report either tingling, itchy, burning or stinging sensation. Why does magnesium oil sting or burn the skin? This sensation is due to friction caused by undissolved particles inside magnesium oil. When you rub magnesium oil on the skin, these particles (which has larger molecule sizes) generates heat or burning sensation through friction. Here are two methods on using topical magnesium oil to reverse hair loss and stimulate hair growth. Use 3 times a week max. 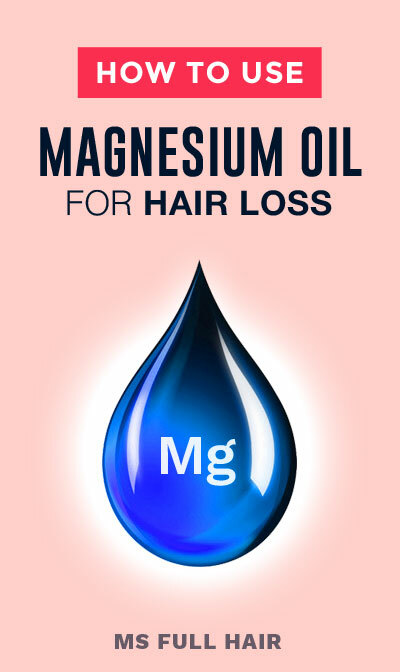 Conclusion – Should I use magnesium oil for hair loss? Putting aside magnesium’s multiple benefits in the body temporarily, studies show that magnesium oil can be used as an effective natural treatment for reversing hair loss. Then, can magnesium oil grow my hair back? 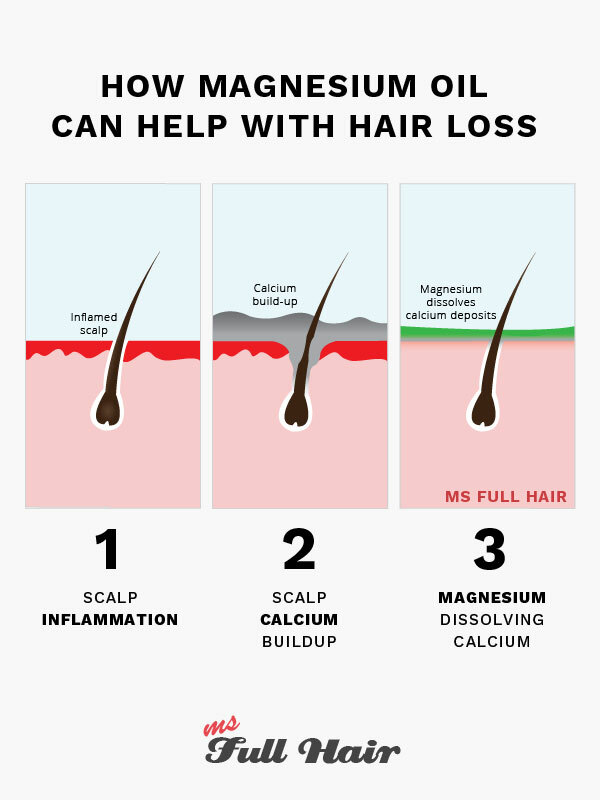 Theoretically, as magnesium oil can dissolve excess calcium deposits on the scalp, it will restore clogged follicles to get proper nutrition, thus stimulate new healthy growth. If you are still hesitant in applying topical magnesium oil, go with more conventional routes – foods or magnesium supplement to store your body with the enough amounts to stop hair loss naturally. Have you tried magnesium oil for hair loss? We would love to hear your experience! Rejuve Health Products Pty Ltd.
Can I not use magnesium oil on my scalp ‘daily’? Why did you mention only thrice a week? Are there any side effects with daily usage? Like magnesium toxicity?